What influences do you draw on for your floors? Influences for the floor will come about through the main theme for the project. We design the floor in harmony with everything else. Each project will have its own influences. For instance, in Salamanca (merchant bank), we designed a motif for the whole project that ran through joinery, ceilings, reception desk and glazing. The motif was a big part of the flooring design for which we used a mixture of travertine and marble with a central bronze disc. How important is the Nordic personality in your work and how does this manifest itself? My Scandinavian background is hugely relevant and important. I would say this manifests itself in the selection of natural materials wherever possible. I have great respect for genuine, original materials. Timber floors have an obvious draw to me and so feature in a lot of our projects, but manifest in very different circumstances, finishes and tones. What unusual flooring projects have you been working on? The one that stands out is the bright pink Bolon floor we put into the breakout area of a lawyer's office. It was quite a brave decision but they loved it! What sectors generate the most demand for your work? We do most of our work in the commercial sector. That said, we've recently completed a couple of residential projects and are currently working on the public spaces of a theatre. How important is flooring design in building projects? Flooring is such a massive element of any design. It sets the scene and the mood, both in terms of aesthetics as well as acoustics. To walk on a deep pile, luxurious carpet or beautiful marble sets a very different tone to walking on carpet tiles or a vinyl floor. The flooring is so often the last element to be completed, and it is just wonderful to realise from the original design vision. Are you using any unusual materials in your flooring designs? We are looking at carpet tiles that clear the air and are super sustainable. We are also just incorporating LED lighting into some of our flooring designs. 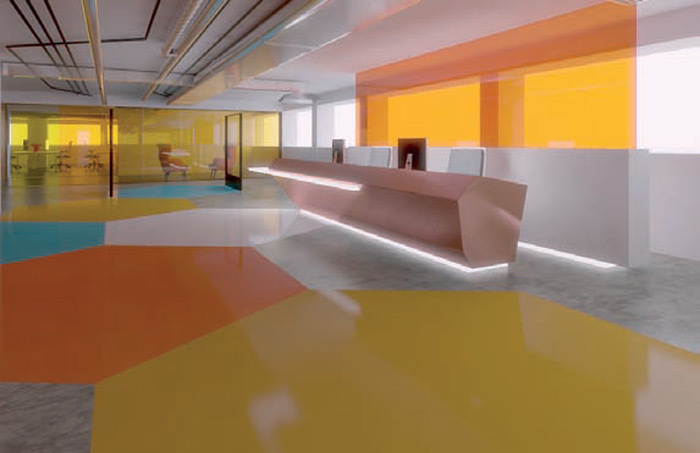 And we are excited about plans to include coloured, polished concrete in one of our forthcoming projects.